A respected scientist from the Cern particle physics laboratory has told the BBC he expects to see "the first glimpse" of the Higgs boson next week. It comes as the search for the mysterious fundamental particle reaches its endgame. 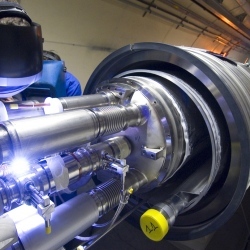 If so, this will be a significant milestone for teams at the famous Large Hadron Collider (LHC). The particle-accelerating machine on the French-Swiss border was built with the hunt for the Higgs as a key goal. The collider smashes beams of protons together in head-on collisions, with signs of the Higgs boson, perhaps, in the debris. The Higgs boson is notoriously difficult to define, but its existence helps us to understand why particles have mass.